Victoria’s most widely circulated daily newspaper, the Herald Sun, recently ran an anti-gun tirade consisting of no less than seven articles and opinion pieces. It involved extending an invitation to the CFCV to have an opinion piece published – and then withdrew the invitation. Then we found a link to another organisation readers weren’t told about. After the first few articles on firearm thefts which were void of any views from the very community the paper was reporting on, we approached one of the editorial staff arguing for the need for some balance. This resulted in an opportunity for us to submit an opinion piece, which we did. The day our article was likely to be printed, the Herald Sun launched a new campaign, this time using the Port Arthur anniversary to call for a ban on the Adler. This was despite the fact the government had already decided against taking that action. Suffice to say our oped didn’t appear. After raising further concerns with the Herald Sun about their Adler stories, the Herald Sun offered us the opportunity to submit a Letter to the Editor. However we rejected that idea, as it was an inadequate balance to seven anti-gun articles which completely ignored shooting industry views. (Click here to see our earlier post on this). That’s because Letters are generally used where clarification or minor corrections are needed. Yet the paper’s attacks on over 200,000 Victorians who hold shooters licences, were obviously premeditated and required the demonstration of more good faith than can be conveyed through a Letter. We weren’t going to settle for this. 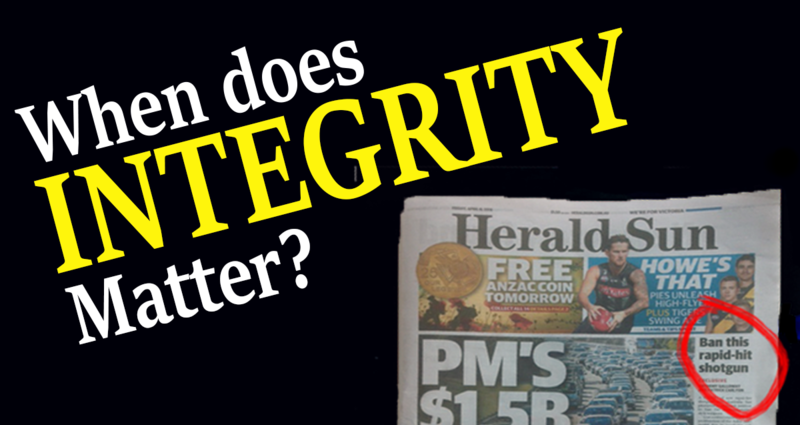 We then considered our other options and formed the view the best one was to write to the Herald Sun raising concerns that it did not comply with its own Code of Conduct. Our complaint was that the stories lacked balance or comment from shooting interests, and the data quoted had been incorrectly used. Other options also had merit, but we figured the best outcome would be a collaborative one, if we could build an argument which strong and reasonable. It was a gamble, but one we were happy to take. The “best case scenario” of an article supporting the shooting community’s views on the firearms debate was worth aiming for. The last step of this process was to direct the letter to the Herald Sun’s Managing Director. So who was the Managing Director? Peter Blunden is a name that has been in the media and with the Herald Sun for a very long time. In addition to being Managing Director of the Herald and Weekly Times, Peter is also on the board of the Alannah and Madeline Foundation, set up in the wake of Port Arthur (click here to see the board – Peter is on the far right hand side). 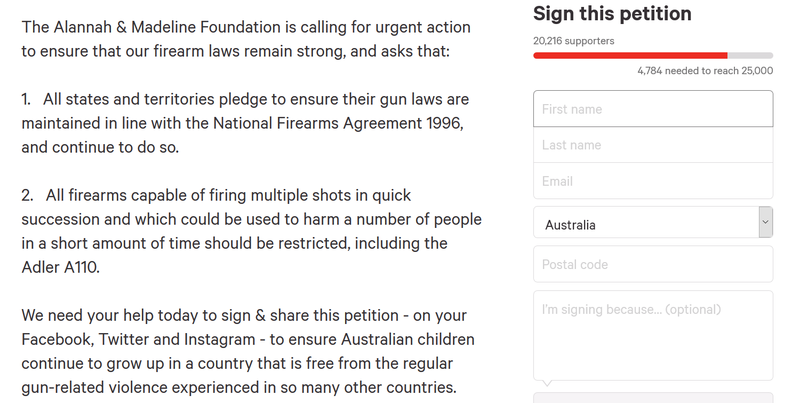 Again the AMF does some great work, but it raised a question of whether there may have been a conflict of interest for Mr Blunden to be on the board of an organisation sponsoring a petition to ban a legal firearm, while steering a paper promoting that petition – without declaring that link. To us, it explains why the paper shunned shooters and supported the petition. It explains why it failed to behave like a newspaper. There was an 8th article which did not contain anti-gun quotes, so we left it out of our complaint to the Herald Sun. However it advocates readers to sign the AMF petition – again without mentioning the paper’s link to the organisation. We were confident the paper wasn’t going to ignore our letter, and to their credit, they did respond in a timely manner. Their response said two things of interest, which came after the author consulted Mr Blunden directly. … we are confident that our coverage of the firearms issue has been compliant with our Code of Conduct and that it reflects the wider community views on this subject. The Code makes no mention about “the wider community views on [firearms]”. It talks about the behaviour expected of the paper, so it was irrelevant to raise it. Also they say they are compliant with the Code, but do not say why. They did not respond to the points we raised, so their response was evasive at best. We previously considered the offer to have a Letter published and rejected it. While the exchange with the paper was rigid but cordial and we appreciate the offer of prominence, the paper’s conduct was far more serious than warranting a simple Letter in response. To accept a Letter would have cheapened the importance we place on the damage the articles did to the shooting community. Seven times in a row. We went back to the paper for a third time to reconsider its position. We argued to have either our own opinion piece or article written by one of their staff to put our views forward. We even suggested they use one of their senior journalists with whom we have had a great working relationship. However the paper affirmed its view it had done nothing wrong. It has failed to offer any form of redress for its actions beyond a Letter to the Editor, which is insulting to say the least. As you can tell, we have been tenacious and fair with the paper every step of the way. This isn’t about firearm thefts and categories, but a sustained prejudice against the 200,000 plus men and women who had done nothing wrong. It is a prejudice that the paper probably doesn’t realise it has. This episode has left chinks in our armour but we’re in this for the longer term fight. We’re determined to make sure the paper knows that we’re not only strong advocates for shooters rights (or for that matter, their views), but an organisation they can work with, but they have to be willing to reciprocate. The paper has passed our contact details to the journalists who wrote the articles and we hope this will lead to a more productive relationship in the future. It will take some time before that happens, but we’ll persevere until we get there. It was unfortunate the Herald Sun embarked on such a sustained and one-sided campaign, arguably contravening several provisions of its own Code of Conduct. Irrespective of what your views on firearms use may be, we think the paper’s conduct has been unacceptable and unprofessional. We believe this an issue the HWT board needs to address. Love your work Neil, keep the bastards honest. why pick on people who have proven beyond any doubt that we are fit and proper people and gone through tests to gain our firearms license you only print what you want people to see as far as i and a lot of other people aprox 2 million firearm owners may just stop buying your daily rag and you can then see what its like to be victomised !! Brilliant! Why can’t NSW have an organisation like CFCV? You’re attempting a reasoned debate with the Herald Sun over guns? They’ll pass your contact details on to their journalists, not one of them will use those contact details. You are dealing with a media organisation which is vehemently opposed to the private ownership of firearms and has been for many years. The Press council is a toothless tiger and they know it, the only way to hit back at the constant antigun diatribe coming from them is secondary boycotts of their advertisers. Without the advertising dollar, the publication of those antigun hate feasts would stop. Brilliantly handled and well done! Well articulated Neil. It is time that there was an open and frank dialogue with regards firearms issues. Unfortunately the Herald Sun will not willing be a part of it. This is hardly a surprise given endemic bias in the media industry. What is more surprising is that they expect Aussies to worry about Australian journos who get caught breaking the rules in sovereign overseas countries. As it has been put; there are three things you can believe in the paper, its name, the date, and the page number you’re on. I wonder if a rival newspaper would find that connection interesting? Who still reports the news? Wow, Brilliant work. Why don’t you demand the sod resign from one post or the other. You can’t fairly make and report the news. As the age old adage goes “Don’t let the truth, get in the way of a good STORY” Surely we are all aware that papers only sell headlines…Which are often not evenly remotely related to facts…..
that we are all together in the same fight to enable all of us to enjoy our sport. This is a news paper? Report the news, not “THEIR” opinion……Disgraceful. One wonders what the response from the public had been if this Paper categorised, gender, color, race, unmarried mothers, gays or any other legal section of the community as being suspiciously unlawful? Yep! There would be outrage! The HS is more ‘toilet paper’ than news paper… but you have made a mistake by not taking up the opportunity to place a large letter in the letters section….conditionally that the letter is published unedited and in full – articulate shooters concerns about the extreme anti-gun bias and attack on shooters..and a few facts about the lever shotgun ‘debate’, get it published! With regard to the AMF – I’m convinced theyre a front with one single motivation, that same motivation of GCA = gun control. Very hard to get our view through as it is the same with the Geelong Advertiser even the local target club cannot get there shooting scores in to the paper with other club scores. Roy, that’s really funny, ha ha ha ha ha, love it.